Due to popular demand, the Salt & Stone Detox came from being a featured monthly special one of our signature packages. Allow yourself to completely let go with this rejuvenating Salt & Stone Detox package. You will love our Himalayan Foot Ritual, where you can let your go into feet and legs rest in a warm bath of Himalayan salts. Grapefruit essential oils and Himalayan scrub relieve your feet of toxins while exfoliating dead skin. The salts used in our treatment are from the world renowned San Francisco Salt Co. These coarse salts, which are incredible skin exfoliants, are mined from ancient sea beds inside the Himalayan Mountains. This salt was formed over 200 million years ago in the primeval sea where the first signs of life formed in the mineral rich water. Himalayan salt has long been used in warm water as a holistic treatment for poor circulation, high blood pressure, dry, damaged or irritated skin, muscle soreness, joint pain and for detoxification. You will love the way this treatment makes your feet feel! Next, turn back the hands of time and clear toxins with our Himalayan Hot Stone Age Defying Facial. 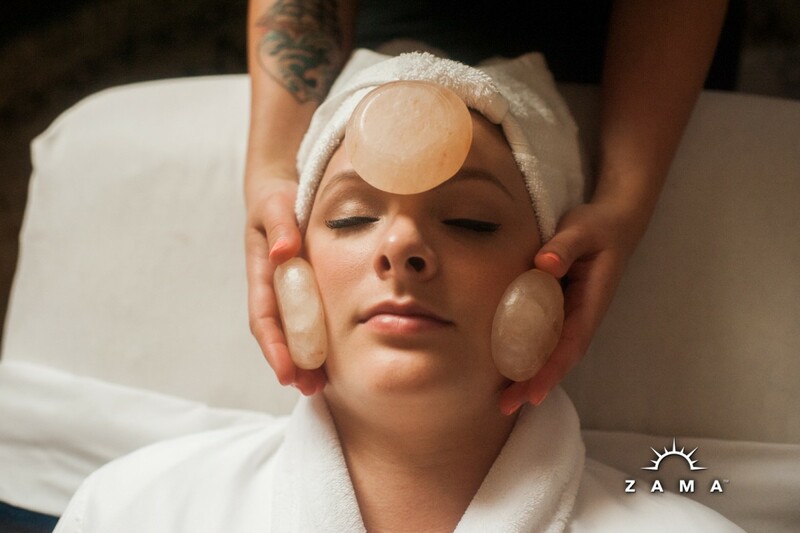 This relaxing, 60 minute facial treatment incorporates warmed Himalayan salt stones that contain an abundance of essential minerals that exfoliate, soften skin, mineralize and gently detox and leaves your skin with a renewed glow and sense of well-being. Because of its location and how it was formed, Himalayan Salt is extremely pure and free of contaminants or pollutants. It gains its pink color from the high content of iron. It also contains trace amounts of 84 minerals and elements including potassium, magnesium, calcium, iodine, zinc and sodium. This treatment utilizes Eminence Mon oi Age Corrective Exfoliating Cleanser which contains finely ground olive seeds that dissolve once washed down the drain (unlike traditional exfoliant beads which can end up where fish live.) Wash away impurities, remove surface debris and experience smooth skin like never before with this multi-action, exfoliating cleanser infused with exotic monoi. This facial also includes a steam treatment. As the warm steam softens your pores and prepares your face to receive the rich treatment and ingredients from Eminence, the steam stimulates blood circulation to the face allowing the skin to look refreshed. The warm steam also allows for deep cleansing resulting in softened, hydrated and rejuvenated skin. To complete the experience, we use a Bamboo Age Corrective Masque and Bamboo Firming Fluid (both from Eminence) that work to dramatically firm and tighten skin while reducing the signs of aging. Achieve nirvana with our 60 minute Swedish Massage. You’ll float away with the induced deep relaxation and alleviated stress. Swedish massage is beneficial during times of increased physical or emotional tension, like the holidays, or simply as part of your regular wellness routine. Other benefits include: increased circulation, toning of the skin, relief from migraines and tension headaches, enhanced immune system, increased joint mobility and flexibility, lower anxiety, and better sleep. Each of our Swedish Massage therapists are trained in various modalities encompassing anatomical and energetic perspectives. They bring an integrated and intuitive approach to each session. The dim lighting, ambient music, and glowing candles used in our massage rooms will help you ease into a more relaxed and peaceful state of mind. To learn more about Zama’s famous Swedish Massage services, watch this informative video. Enjoy a glass of local and organic kombucha from Oregonic Tonic.